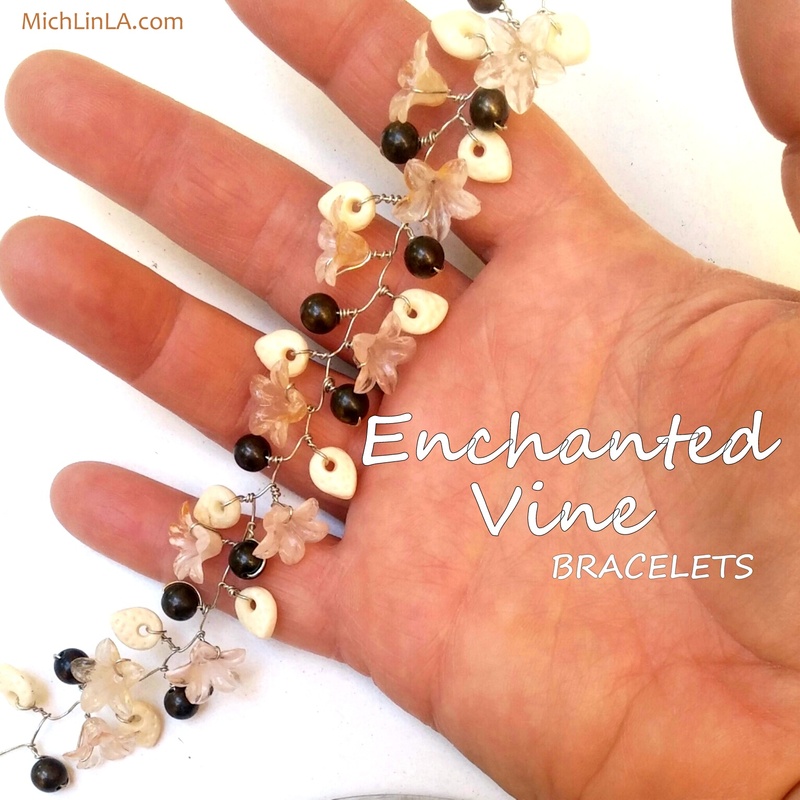 Mich L. in L.A.: Some Enchanted Jewelry...Vine Bracelets! Something cool to show you today (tho not my typical repurposed project). 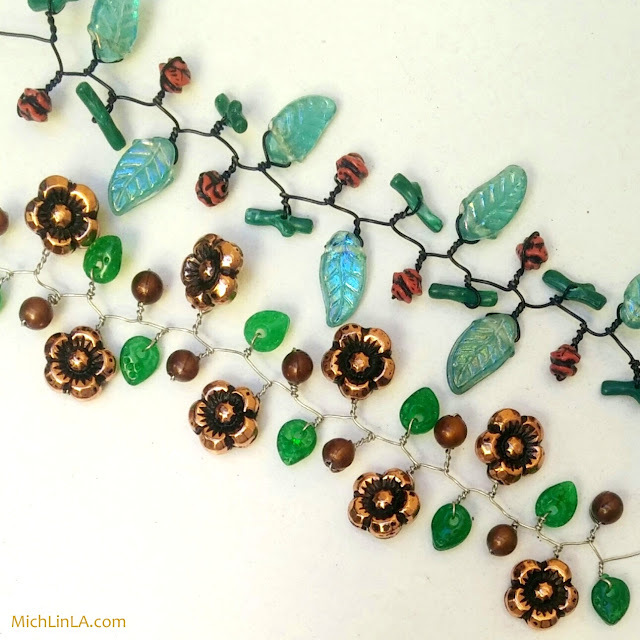 I have been making beaded vines by the yard, they are growing everywhere and taking over my life. Look! What are they for? For making vine-y, va-va-voom-y bracelets. This fun wirework technique can be played so many ways. And I do so love a full, intricate-looking bracelet that doesn't take a lot of work. 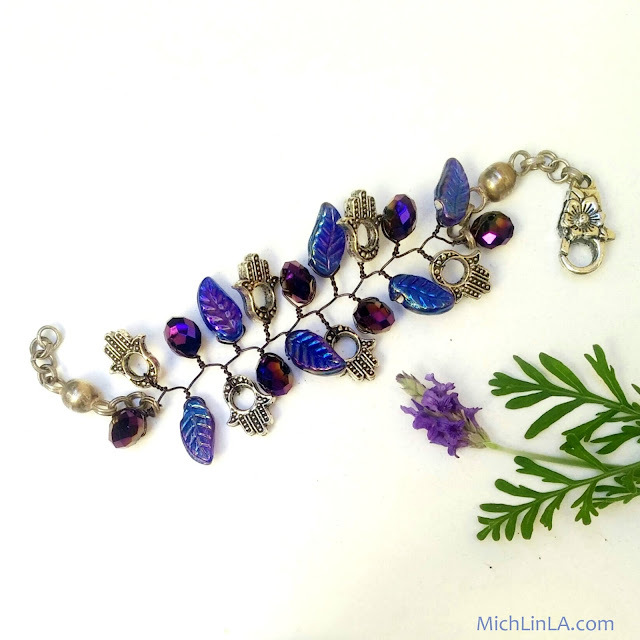 These 'enchanted vine' bracelets are featured in the Spring 2016 issue of Belle Armoire Jewelry. I did a full tutorial for them with step-by-step pics; it's available March 1st. I'm rather excited, having been a huge fan of Belle Armoire Jewelry forevah! 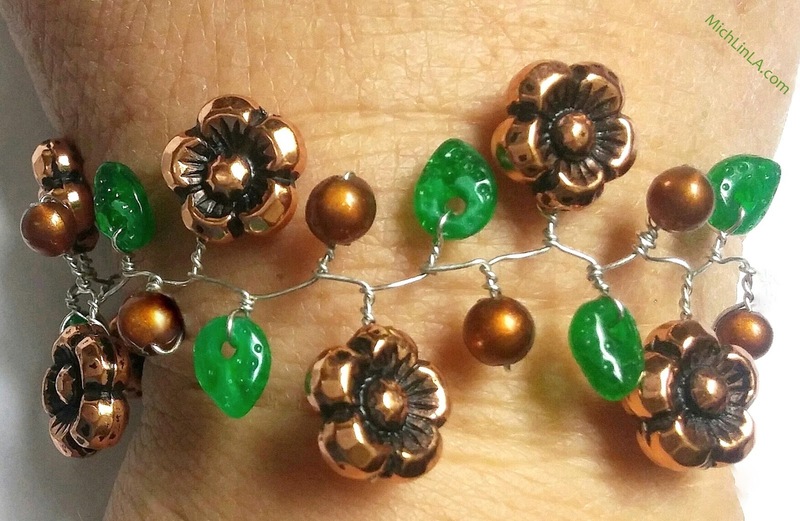 A fancy vine jewel makes an impressive gift, and hey, nobody has to know how easy it was to create. How about for Mother's Day - you know it's coming up, you guys! Or make one in bridal tones - white, taupe, oyster, cream - lovely for a wedding. Hope you have a chance to check it out! Now please excuse me, I have to untangle myself from a few creepers. love love love, this may even get me making some jewelry! Though I'll admit my first thought was, oh perfect for wrapping around a hoop as a base for a mobile, silly me. Thanks for sharing on craft schooling Sunday as always! Oh, you have the right idea, Sara - I use them for home decor all the time, they make the most beautiful candle bases, for example! Thanks for the sweet comment, hope you give it a try. Mwah! Congrats on the magazine feature!!! Thanks, Jessica...I am geeking out just the teensiest bit! These are absolutely gorgeous! You are extremely gifted and it has made my day I stumbled upon your blog... Thank you! Hi, Maja! Thanks so much for the sweet comment - so glad you liked these twisty little creations! Thank YOU, Maja, your comment made MY day! They are beautiful Michelle! It's a great reward for all your work! Congrats! Thanks so much, Z!!! I'm new to magazine articles, very enjoyable to see these vines in print. These are just the prettiest vines ever and such a clever idea! Congrats to you for being featured in such a lovely magazine. Thank you so much, Pat! Fun to have the 15 minutes! These bracelets are absolutely gorgeous. Congratulations on your magazine feature. 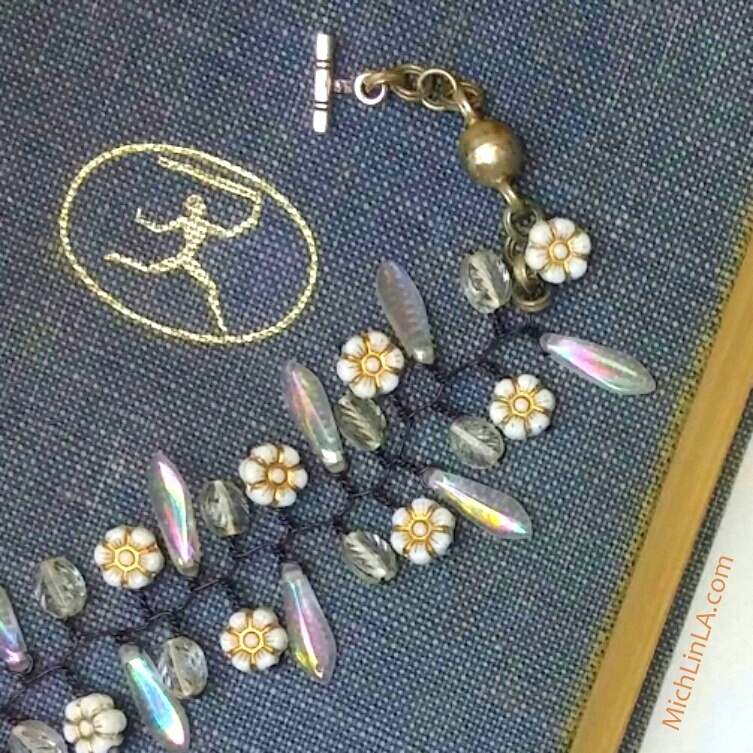 Thanks, Claire, so happy you liked the jewels! Thanks so much! They are much simpler than they look, I swear. And the limerick...well, I doubt it keeps people from stealing stuff, but it makes me laugh. Congrats at getting featured in the magazine. Thank you, Anna! Love your idea to make it in autumn colors, I can totally see one with turning-orange fall foliage. Thanks for the sweet comment! 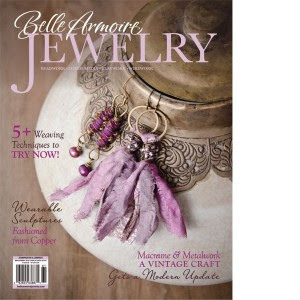 Congratulations on having your tutorial published in Bell Armoire Jewelry! I will be on the look out for it next time I'm at the bookstore.